Compound Layouts and Layout Combos both allow for several pack layouts to be combined into a single layout. This combined layout can be treated as any other pack layout - it can be given a name, description, key and can be ordered by any of the ordering methods. The difference between Compound Layouts and Layout Combos is how the components are added to the print queue once ordered. Layout Combos are split into their individual layouts before being added to the print queue as separate pages. To define a new Compound Layout go to the Template Designer (Design Mode) then select Edit>Compound Layouts ... from the main menu. The Compound Layout window appears with the most recently defined Compound Layout. To add a pack layout click the green "Add Layout" icon. A window appears allowing the user to browse to and add the desired pack layout. Continue to add indvidual pack layouts as desired. Tick the "Cut" check box if you wish the individual layouts to printed as separate pages. 7. Specify the paper size and whether to arrange the individual layouts left to right or top down. As mentioned above, compound layouts are placed into the print queue as a single page. 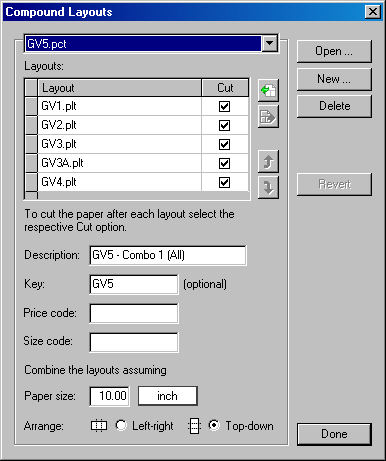 When printed, the individual layouts will be cut sheets (provided the "Cut" box is checked) however each page will be printed on the same size paper. Therefore when defining a Compound Layout it is important to consider the paper size when adding the individual layouts in order to avoid wastage. Layout combos are very similar to Compound Layouts and are used for the same purpose - to combine individual layouts into a single layout. The key difference is that Layout Combos add the individual components to the print queue as separate pages. This has some important implications. To further help understand the differences between the two, think of Layout Combos as ordering the individual layouts separately. Whereas think of a Compound Layout as joining the individual layouts into a single template then ordering it as a whole. 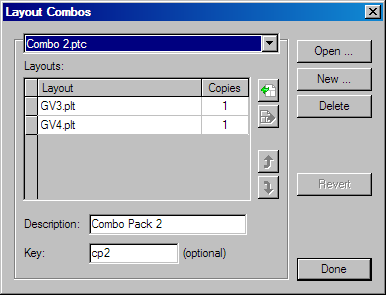 To define a new Layout Combo go to the Template Designer (DesignMode) then select Edit>Layout Combos . The steps involved in defining and editing a Layout Combo are basically the same as that for a Compound Layout with the following key differences. If any changes are made to an individual layout, the change will not be automatically carried through to the combined layout. It is necessary to open the combined layout, remove the individual layout and add it back again before the change will take effect.